F45 Training Tower Bridge is an iconic group training concept, 45 minutes of High Intensity, Interval based Functional Training in a Team Environment. Team Training. Life Changing. Welcome to the world's biggest functional training network. We are excited to bring this global fitness phenomenon to Tower Bridge in St Katharine Docks London. We can't wait to welcome and train with you! An iconic group training concept, 45 minutes of High Intensity, Interval based Functional Training in a Team Environment. The most innovative, challenging and systemised team training workout in the world that keep our members coming back for more. Our workouts are designed to unify the muscle groups of the body and to make you look, move and perform better in all aspects of your life. Our classes are high intensity interval training (HIIT) workouts that use functional cardio and strength movements that will quickly improve your fitness, whatever level you are. Personal attention from our expert trainers during the classes mean it's like personal training, but in a group. Start with our Introductory Two Weeks of Unlimited Classes, No Restrictions on Class Times, Designed to give an Immersive Experience to the Our Training, Studio and Community. If you like our vibe, then join our tribe! No obligation. Functional Training is the engagement in exercises that mimic or recreate everyday movement. These types of exercises typically involve the use of your full body and multiple muscle groups. This style of training builds and sculpts lean, functional muscle – Lifting, Squatting, Jumping, Twisting, Pulling, Pushing, Punching, Kicking, Rowing, Biking – all of these movements qualify as "Functional". Get ready for 45 minutes of high intensity intervals in a structured team training class environment. Our workouts are fueled and organized by the robust technology systems that we have in place in all of our studios. A series of TV's mounted on the front wall of our studios provide an organized, station-by-station diagram for each daily workout. With the guidance and motivation of two Trainers every session, this system is a visual tool for our members to progress from exercise station to station throughout the workout. Combined with exclusive Lionheart Rate monitoring technology that tracks your progress, keeps you competitive and moving with the team! Learn More about Lionheart Rate Technology. The employment of our Functional Training, Circuit workouts in a Team Training atmosphere is the final factor fueling the workout's dynamism. The motivation and encouragement in a Group Training facility create a pulsing, upbeat environment where goals are met and exceeded. Communities promoting fitness, good health and growth are forged around the world and are the source of our strength as an international brand. Merging 3 separate leading-edge fitness training styles into one, consummate and compelling group training experience. We combine elements of High-Intensity Interval Training (HIIT), Circuit Training, and Functional Training. The fusion of these three training concepts has lead to the development of 27 different, 45 minute workout experiences, with more in development by our Athletics Department. This combination of interval, cardiovascular and strength training has been proven to be the most effective workout method for burning fat and building lean muscle. We've gained a cult following of A-Listers and they love it. From LA to London and down-under to Sydney, big name celebrities have the bug and keep coming back for more. Nicole Kidman, Joel Madden, Ricky Martin, Sam Smith and a very worthwhile mention for our very own Aussie Hugh Jackman. Ever wondered how Mr Jackman maintained that Wolverine body? If it's good enough for Hugh, it's good enough for you! Come jump around with us to see why F45 was voted 'Best London Fitness Class' by GQ Magazin and experience why our Members love being a part of our fitness community! F45 is a proven training system combining Functional Movement and High Intensity Interval Training that not only gets real results but changes people's lives & attitude towards fitness and themselves. We are also home to the infamous Global 8 Week Challenge - the ultimate training & nutrition program. Natural Light, No Basement, Open Rectangular Training Floor, No Pillars, Air-Conditioning, High Spec Change-Room Facilities with Underfloor Heating, Digital Lockers, Toiletries, Blow Dryers and Hair Straighteners. The training aspect of what we offer is obviously key, but we recognise the whole member experience needs to be on point from beginning to end, right down to presentation and wanting to know your name. We're a friendly bunch! Proud to have created a second home for our members and developed a culture that keeps your weekly attendance high. Join any of the Member Chat Forums. Real People. Real Results. We all go to the gym wanting to get something out of it (results), which is important. But we have to have fun along the way or it doesn't work. There is no good or bad, we help to make better choices at F45TB. Thumbs up tried and tasted, available daily and on-demand featuring F45 Challenge Shakes when they appear on the meal plan taking the hassle out of your morning food prep. Order before, collect & pay after class. 4 Challenges per year. Access to the Challenge is included as a Monthly Member plus a one-off payment for In-Studio Accuniq Body Scans at Weeks 1 & 8 including our infamous Medal Presentation and Party. We like to share the F45TB love. If you sign up as a Monthly Member you're entitled to Bring-A-Friend for Free with our 'Friendly Friday' OR £5 any day with 'Friendly Fiver'. Rules are Once Only per Friend per Class. We are a community based studio and encourage member to come with a can-do and friendly manner. Hosted every quarter culminating the end of 8 Week Challenge, a chance to let your hair down and party like it's 99! If you're training intensively, you may need additional therapy to assist mobility and recovery. Focused sessions that aide movement, performance and technique whilst complementing your functional training. Who needs rest days?! Sundays are officially the new Mondays. Fit in an added or alternative hybrid (strength & cardio) workout and ease your schedule during the work week by jumping around with us on a Sunday. We don't charge for sweat or shower towels. We know you want to be challenged but also appreciate the softer touches like towels, posh shower products and toiletries like deodorant, wet bags, styling products and clips. We champion local and small business. Lulu Lemon, Lorna Jane, Whatever It Takes, Fresh Fitness Foods, Natural Kitchen, Urban Baristas are just some of the partners we've secured our members benefits and incentives. Read why F45 has become a global fitness sensation the world over. From fitness enthusiasts to celebrities, professional athletes and those wanting to get fit, move better and be part of something challenging, inclusive and engaging. A wonderfully binding sense of fraternity possibly more uplifting than collective happiness. Such is the lure of the fitness craze that just keeps on giving... completely worth it. Really Change Your Body in 8 Weeks? The Australian group training class that's taking over London. And it won't be long before it takes over the UK... will challenge your body beyond what you think it's capable of. If you love HIIT and are always looking for a challenge then this is right up your street. The Aussie workout is new to the UK and looking to revolutionise the way you get your cardio in. Book classes and manage all your training through the dedicated APP. Make changes to your profile or account in one place. It's all at your finger tips. You must log into your registered FFFTB Online Client Mind Body store OR the App to book your classes and manage your account. You can only book into classes if you have transacted a 'Buy Services' membership option. This includes any introductory offer. Registered Company Adam & The Ant Ltd. #10505351 VAT #282824974. Operating as F45 Training Tower Bridge under franchise agreement from F45 Training Limited. 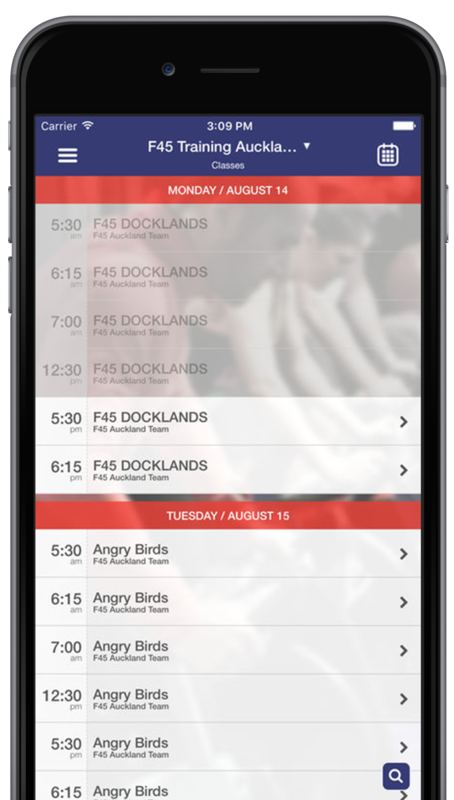 The F45 Training's website at http://f45training.co.uk and related mobile applications (together, the Website) are owned and operated by (ACN 162 731 900) of 30 Alma Street Paddington NSW, Australia ("F45", "we", "us", "our"). 2.1 Seek advice from Medical Professional As with any physical activity, it is important that before beginning any fitness regime, you consult with your health care professional to ensure that you are mindful of your current health and any restrictions that are appropriate for you. You should immediately seek medical attention if there are any unanticipated changes to your physical condition at any time. 2.2 Information provided on Website All information provided by us on the Website is provided in good faith. We derive our information from sources which we believe to be accurate and up to date as at the date of publication. We may update any information at any time but you acknowledge that the information on the Website may not be themost current knowledge. In addition, to the extent permitted by law, we do not make any representations or warranties that any information we provide is reliable, accurate or complete and we make no guarantees of any specific result from use of this Website or the information service provided through it. To the extent permitted by law, we are not liable for any loss arising from any action taken or reliance by you on any information or material available on the Website. 2.3 Nutritional Information Nutritional information provided on the Website is taken from sources provided by third parties, including the Food Standards Australia New Zealand (FSANZ) NUTTAB 2010 guide to nutrient content. Before relying on any nutritional information on the Website, you should carefully evaluate the accuracy, completeness and relevance of this information for your purposes, and consider the need to obtain appropriate expert advice relevant to your circumstances. FSANZ has made considerable effort to ensure the quality of information in NUTTAB 2010, however, none of FSANZ, F45 or any other provider of nutritional information on the Website gives any warranty that the information is free from error or suitable for your purposes. There are limitations associated with food composition databases. Nutrient data published in a database such as NUTTAB 2010 may represent an averageof the nutrient content of a particular sample of foods and ingredients, determined at a particular time. The nutrient composition of foods and ingredients can vary substantially between batches and brands because of a number of factors, including changes in season, changes in formulation, processing practices and ingredient source. While most of the data contained in NUTTAB 2010 are generated from analysed values, some of the data are borrowed from overseas food composition tables; supplied by the food industry; taken from food labels; imputed from similar foods; or calculated using a recipe approach. 2.4 Quality of the Website We do not promise that the Website will be error-free or uninterrupted. The Website and its content are delivered on an "as-is" and "as-available" basis. We cannot ensure that files you download from the Site will be free of viruses or contamination or destructive features. Receipt of emails, or other Internet based communications such as via Face book or Twitter from us cannot be guaranteed. The delivery of video messages is dependant upon third party providers and therefore outside of our control. Low internet connection speeds and/or older operating systems and/or browsers may result in slower page load times and an inability to view videos on the website. 2.5 Third Party Content We do not accept responsibility for any loss or damage, however caused (including through negligence), which you may directly or indirectly suffer in connection with or arising from the products or services including acts, omissions and conduct of any third party users of the Website, other members, other contributors to the Website, and advertisers or sponsors. We are not responsible for the products, services, advice, information, actions or failure to act of any third parties referenced on the Website (including User Content of other users of the Website referred to below). Where the information made available over the Website contains opinions or judgements of third parties (including advertisers), we do not purport to endorse the contents of that opinion or advice, nor do we guarantee the accuracy or completeness of that content, and we will not accept liability for loss or damage arising from your reliance upon any information obtained through this service. It remains your responsibility to evaluate the accuracy, completeness and usefulness of any such information. 2.6 Non F45 services Members and third parties are not permitted to advertise or promote their products or services, or the products or services of others, on any part of the Website, or its associated forums, without written consent from the F45. If in the opinion of the F45 members or third parties are engaged in advertising, promotion or providing advice to other participants of the Website, then F45 reserves the right to suspend or terminate the membership of any member participating in such conduct or to ban any third party from participating on the Website. 2.7 Security of Information No data transmission over the Internet can be guaranteed as totally secure. While we strive to protect such information, we do not warrant and cannotensure the security of any information which you transmit to us. Accordingly, any information which you transmit to us is transmitted at your own risk. Nevertheless, once we receive your transmission, we will take reasonable steps to preserve the security of such information. 2.8 Indirect and Consequential Loss To the extent permitted by law, and subject to clause , in no event will we (or our employees, agents and subcontractors) be liable to you for indirect, special or incidental, punitive, exemplary or consequential loss, costs, expenses and damages (or any loss of revenue, loss of data, loss of profits or loss of opportunity whether the losses be direct or indirect), suffered or incurred by you and arising out of or in connection with your access to or use of the Website, any linked website, your reliance on any information obtained through the Website or your use of any services on the Website, regardless of whether liability is based on any breach of contract, tort (including negligence) or warranty, arises under statute, or any other basis of liability. Further, even if you do not fall into the above classes of persons, you acknowledge that the service that we provide on the Website is an information service only, and that you are solely responsible for (at your own discretion) following (or not following) any exercise program or regime that is included as part of the information service. Our service does not include any supervision or monitoring of your activity, and we are not responsible for any injuries that you may suffer as a result of following the exercise program or regime. To the extent we supply any "recreational services" or "recreational activities" (within the meaning of the Competition and Consumer Act (2010) (Cth) or any State or Territory civil liability or consumer protection legislation), you acknowledge that your participation in the recreational services and activities may involve risks, including personal injury and death. Prior to participating in the recreational services and activities, you must assess all the risks involved, including risks that may be caused by your own acts or omissions, your health condition, those of other users of the Website and risks that are not known to you or are not readily foreseeable at the time of participating in the recreational services and activities. By participating, you are doing so voluntarily and at your own risk. To the extent permitted and required by law, this is a risk warning pursuant to the various civil liability and consumer protection legislation. You assume all risks in connection with your participation in any recreational services and activities that we may provide. To the maximum extent permitted by law, we exclude all liability arising from or in connection with any recreational services or activities for: (1) death; (2) physical or mental injury (including the aggravation, acceleration or recurrence of such an injury); (3) the contraction, aggravation or acceleration of a disease; and (4) the coming into existence, the aggravation, acceleration or recurrence of any other condition, circumstance, occurrence, activity, form of behaviour, course of conduct or state of affairs: (a) that is or may be harmful or disadvantageous to you or the community; or (b) that may result in harm ordisadvantage to you or the community, resulting from the supply of recreational services or recreational activities, but we do not exclude our liability to significant personal injury which is caused by our reckless conduct in the supply of recreational services or activities. All names, logos and trade marks on this Website are the property of their respective owners. Nothing on the Website should be interpreted as grantingany rights to commercial use or to distribute any names, logos or trademarks, without the express written agreement of the relevant owners. (d) systematic downloading or "scraping" of content of the Website. You are bound by the latest version of the applicable Terms and Conditions. We may vary, amend or add to these terms at any time. Where there arematerial changes to these Terms and Conditions that could adversely affect you or F45 members, we will provide you additional notice to you at the time that you access the Website following any variation. (a) The F45 Training and associated contest is a game of skill. Chance plays no part in determining the winner. Each entry will be individually judged, based upon individual overly body transformation, which will be determined by taking into account body fat percentage loss, weight loss and overall appearance. (i) The winner is required to obtain the relevant & suitable travel insurance at their own expense in order to be able to take the competition prize. It is the traveller's personal responsibility to ensure that they have valid documentation, including but not limited to, Valid passports, visas, and health requirements, which meet the requirements of immigration and other government authorities at every destination. Any fines, penalties, payments or expenditures incurred as a result of such documents not meeting the requirements of those authorities will be the sole responsibility of the traveller/s. (j) Prize includes return international flights and 5 nights accommodation to a holiday destination to the value of $3,300. The location will be determined according to winner's country of residence. Any Additional spending money, flights, meals, insurance, taxes, passports, visas, extra accommodation, items of a personal nature, inoculations, travel to and from departure point, additions to stipulated itineraries and offered flights and all other ancillary costs are the responsibility of the winner. Unless expressly stated, all other expenses become the responsibility of the winner.